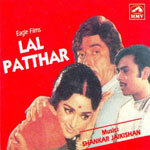 "Lal Patthar" is a 1971 hindi film which has Vinod Mehra, Raaj Kumar, Hema Malini and Rakhee Gulzar in lead roles. We have one song lyrics and one video song of Lal Patthar. Shankar and Jaikishan have composed its music. Kishore Kumar has sung these songs while Dev Kohli has penned its lyrics.